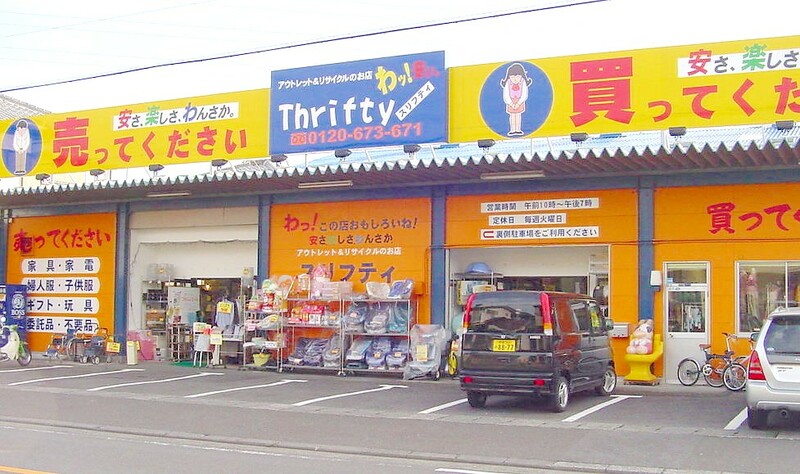 Revisiting a topic from the earlier days of AccessJ, one of the biggest money-saving tips we've found when getting settled in the country is the recycle shop (リサイクルショップ). "Recycle shop" is the trendy, eco-culture term for a pawnbroker (質屋さん, shichiyasan) or secondhand store (中古品店, chuukohinten). In the intervening decades since Japan's bubble and its Huxleyan buy-new culture, recycle shop franchises have sprung up and flourished around Japan like a nationwide plague of daisies. The first chain I became accustomed with was BOOKOFF, a secondhand dealer specializing in book, CD, movie, and game software. BOOKOFF and its associated stores, including mirthfully named HARDOFF (electronics hardware, musical instruments), are a decent way to save a buck on home entertainment. The chain has other associated stores as well, like OFFHOUSE, which deals in clothing and home interior. In a recent article series, I've been recounting in exhaustive (...more like exhausting) detail my move to a new apartment and all the steps it involved. Usually my moves involve picking up or shucking off some furniture and home appliances. I don't have an OFFHOUSE near my home now, but another chain I often make use of is 2nd STREET. 2nd STREET seems to handle just about any kind of used commodity other than books. It's like all the BOOKOFF spinoffs combined into one. Free kei-truck rentals for moving your purchase. Most large or chain recycle stores have a delivery or kei-truck rental service available to customers. If you buy a refrigerator or something you can't manage on your own, you'll be able to ask someone at the customer service desk about having it shipped or borrowing a kei-truck for a day to get it to your home. In my experience, delivery within the same neighborhood is about 1,500 yen. If your apartment isn't on the ground floor and you don't have an elevator, you might have to pay a surcharge for the delivery man to heft your couch or whatever up the stairs. A surcharge may also apply if you insist the item be delivered on a weekend. Borrowing a kei-truck to move the item yourself, on the other hand, is often free-of-charge. Thanks to the established delivery systems and wide selection, I visit the chain stores a lot. But the best deals I've found on used items were always at local shops. By local shops, I'm talking about the tiny-storefronted recycle shop in your neighborhood. It's run by one really old looking, chain-smoking, incomprehensible Japanese guy who runs the entire business himself--and probably lives on the premises, too. The inside of these stores is always incredibly cluttered, and the items may or may not have price tags on them. You're expected to haggle here. I have a lot of fun when I go shopping at these places, because its easy to build rapport with the store owner and ask for a discount when buying an armful of things all at once. When I was looking at a gas stove at one of these shops, a kind owner went out of his way to lug the stove into the back, where he had a kitchen and bedroom. He hooked the stove up to his own gas line to show me that it worked. It's a different and more personable experience than a sticker warranty or a trip to the customer service center. This mom-and-pop type of recycle shop probably won't have an online presence, unlike BOOKOFF or 2nd STREET, but that doesn't mean it's hard to find one. Simply pull up Google Maps, navigate to your neighborhood, and pop the words リサイクルショップ into the search bar. You can get telephone numbers from the results, or you can just check locations and visit them in person next time you're out for a walk or bicycle ride around town. Being Cheap in Japan: Avoid "bill printing fees"